Former U.S. Attorney General Alberto Gonzales will speak at Sam Houston State University on Nov. 20 as part of the President’s Speaker Series. Gonzales was born in San Antonio and grew up in Houston. He was one of eight children and the only one in his family to attend college. He is a graduate of Rice University and received his law degree from Harvard Law School. After completing law school, he joined the firm of Vinson & Elkins, L.L.P., in Houston and later became a partner. In 1995, he was named general counsel to then-Texas governor George W. Bush, eventually rising to serve as secretary of state of Texas in 1997 and as justice to the Texas Supreme Court in 1999. As a counsel to the president in 2001, he was with Bush on Sept. 11. Gonzales, with other leaders, began to formulate a response to the terrorist attacks immediately. 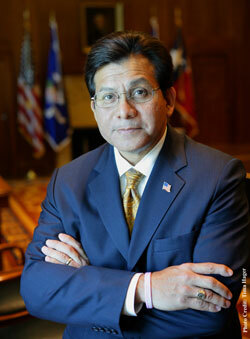 Gonzales served as the 80th attorney general from 2005 to 2007 under President George W. Bush. He was the first Hispanic to lead the nation’s largest law enforcement office. As the director of the Department of Justice, Gonzales focused on protecting children from sexual predators, preventing acts of terrorism and reducing the threats of gangs, drugs and violent crime. He stepped down in 2007 and conducted a mediation and counseling practice in Austin and taught political science at Texas Tech University. In 2011, Belmont University in Nashville, Tenn., announced the creation of an endowed professorship in its College of Law, the Doyle Rogers Distinguished Chair of Law. Gonzales was selected as the first professor to hold the position. In addressing audiences around the country, Gonzales speaks about the strength of his heritage and insights into his background, public service, faith, family and freedom. Having served during one of the United States’s most turbulent time, he also offers a unique perspective on homeland security and the safety of the nation. Created in 2002 by SHSU President Emeritus Jim Gaertner and originally underwritten by the estate of the late Huntsville resident Lu Ellen Gibbs, the President’s Speaker Series is designed to bring prominent leaders to the Sam Houston State University campus. Speakers are chosen for their ability to deliver messages of substance with the potential to significantly impact the student body. For more information, contact the President’s Office at 936.294.3415 or events@shsu.edu.